After hours of travel in hopes of getting somewhere to photograph before the sun went down, we arrived at Useful Island, Antarctica. Sunset was 15 minutes away and itâs a long hike up to the top in November, through heavy snow. Having been there before, I had some idea of where I wanted to go. I rushed up to the top, my heart beating fast, almost out of breath. I pushed on, knowing time was running out. 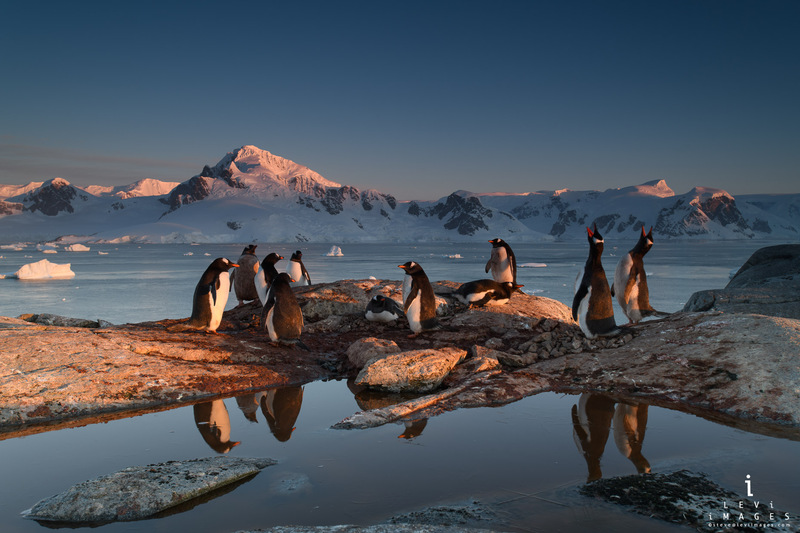 With moments to spare, I found this small colony of Gentoo penguins (Pygoscelis papua) on the edge of some rocks, reflected in a small puddle, with the mountains lit by the pink sunset light in the background. The penguins sounding their call added the final touch.